Bob Thistle has a passion for Imperial Carnival, in particular for the swung vases in pink. These photos show two of his collections of Imperial contemporary swung vases. He sent these to me in 2004. 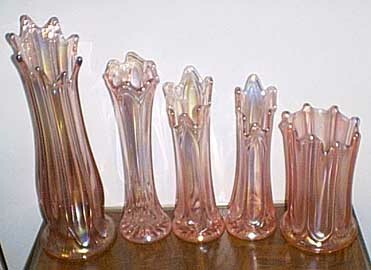 One photo shows (5) Sample or Experimental Pink Carnival "Ribbed Pattern" Swung Vases found in the Imperial Vault upon closing, this pattern was never introduced into the Pink Carnival regular line. A few are unmarked, a few are marked ALIG. 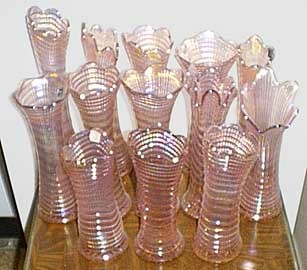 Second photo shows (13) Pink Carnival Ripple Vases, regular line, in various heights, shapes, and top treatments. These are all marked LIG. If my memory serves me, I was told these Pink Carnival Vases were made one day only, for a several hour period, so I'm not sure how many were actually made. I would welcome more information from someone who knows for sure.